An interview with Steffni Ault. Energetic! Fun! Musical! Time traveling! Nostalgic! When a group of young people find an old board game hidden in the basement a musical “jumanji” game is on! Tripper and Oakley, the game masters send the teens back in time to the 50’s, 60’s, 80’s and 90’s to discover music, dance steps and nostalgia from each decade. What do their parents always talk about? What’s the Twist? What’s a Rubik’s cube? What’s the Hustle? In each decade the teens must meet the challenge of learning a new dance step and finding an item from each decade to advance in the game to return back to their own time! During the time traveling the audience can be transported back in time with a power point depicting pop culture from each decade. First off, tell us a bit about Edmonton Musical Theatre – what is your mandate and how do you work towards it? EMT is dedicated solely to educating its students to the highest degree of professionalism in the area of musical theatre arts. EMT empowers them with a greater appreciation of the arts, a sense of achievement and personal growth, and a new level of confidence. Over our 38 seasons EMT is proud to be an innovative, versatile and inclusive training environment receiving the Mayor’s Outstanding Service Award in 2010. We offer training programs for ages 5 years and older that builds the basic skills in the musical theatre arts along with performance skills through productions. You’ve adapted Back in Time from an original script by Jaime Johansson and Barb Hubbard – what did you want your adaptation to accomplish? This production was originally created for the Tween Program Year End Performance to showcase the students involved in that year’s program. The concept was such a great one that we wanted to use the concept and the script for a Fringe Production. We changed some characters and songs around and also shorten the length of the show to fit better for a Fringe production. 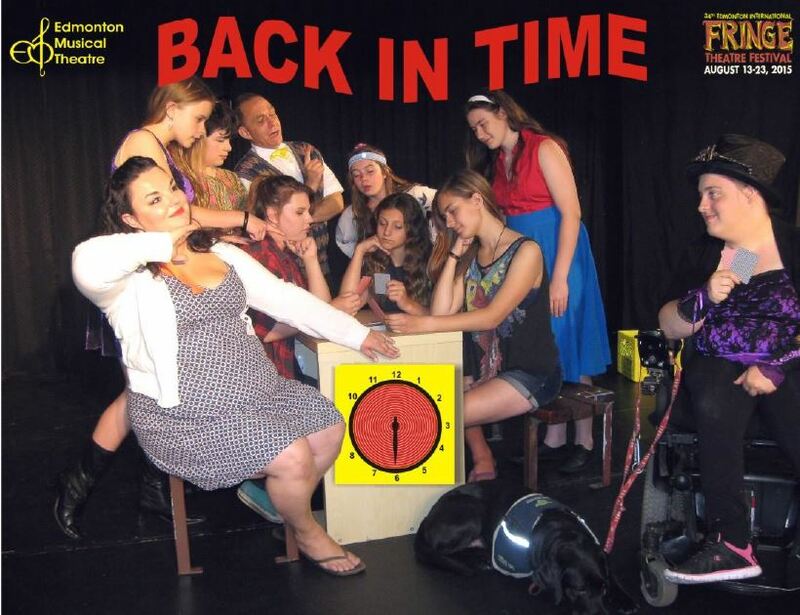 Back in Time is a family-friendly show – what does the show offer to both children and their parents? The parents will love seeing the nostalgic images on the power point and will recognize all of the music from the past. The children will perhaps experience some of the music for the first time. But they will also recognize some games and toys that happen to be from waaay back, like Play Doh from the 50’s and Connect 4 from the 60’s! All of the actors in the show are EMT alumni! They have all been involved either in a training program or a production, or for some, both! EMT is an inclusive organization. Carly Neis is an actor, who happens to be in a wheelchair who plays the character of Tripper, the Game Master. Along with her real life service dog, Oakley, they both play an important role in our show.